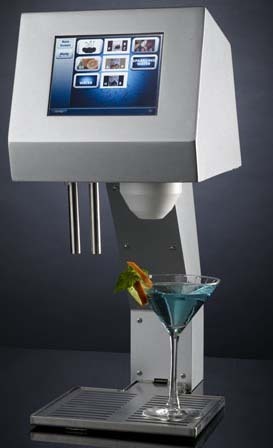 “This robo-bartender takes orders, mixes cocktails, and then cleans up. Beneath the countertop dispenser, a dorm-style refrigerator holds up to 12 types of alcohol and mixers, plus a water-line link and a carbon-dioxide cartridge for fizz. Atop the fridge sits the brain: an Internet-linked Windows XP computer. Enter new recipes on the touchscreen or on a personalized Web page, where you can also trade formulas with your friends. I am so for this..A bartender I don’t have to tip!